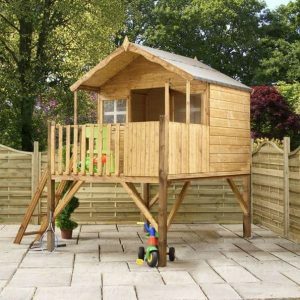 Very few playhouses give such a striking and impressive first impression as the 7′ 8″ x 6′ 6″ Honeysuckle Tower Playhouse does. With its high tower design the kids are going to have just as much fun climbing up the child safe ladder and then jumping back down as they are spending time in the spacious playhouse. Before you even get into the playhouse there is a decking area that has a little protection from the rain thanks to the veranda. Kids can put a chair and table up here when the weather is good and have an outdoor tea party. 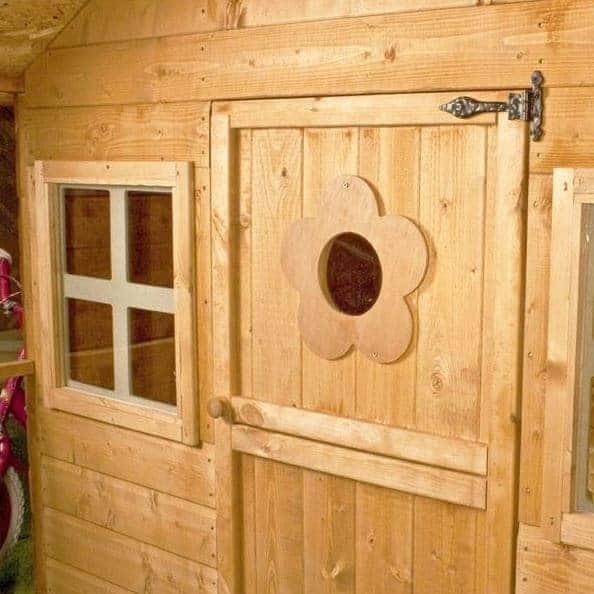 Two large windows either side of the door give the children a great view of who is coming to visit them in their playhouse. Very high quality and smooth timber has been used to make this playhouse and in general the materials used are very good. It is a very robust structure thanks to the tongue and groove shiplap cladding being backed up with a strong frame. The floor in the playhouse is solid sheet board and out on the decking we have some very attractive tongue and groove boarding which helps add to the overall charm. For the roof, Waltons have used solid sheet boarding and covered it with sand felt. 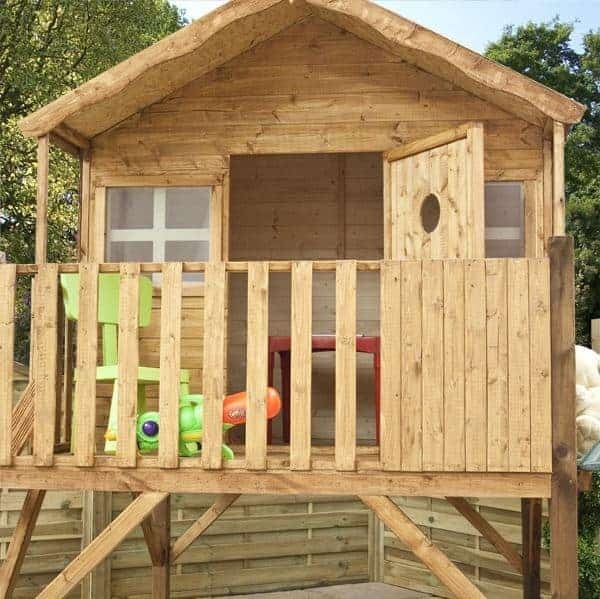 It really is quite amazing how high quality this tower playhouse is when the price is so reasonable. 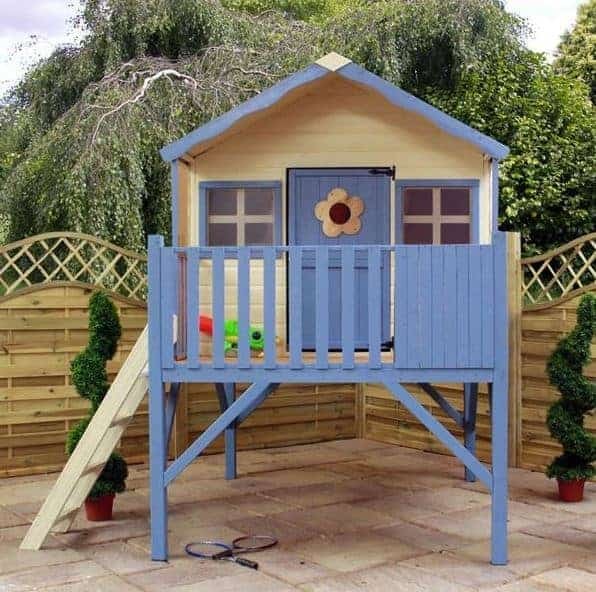 Here we have one of the most impressive looking playhouses from Walton’s, the 7′ 8″ x 6′ 6″ Honeysuckle Tower Playhouse. This looks like something you would find on the island of Robinson Crusoe with its cabin style look. 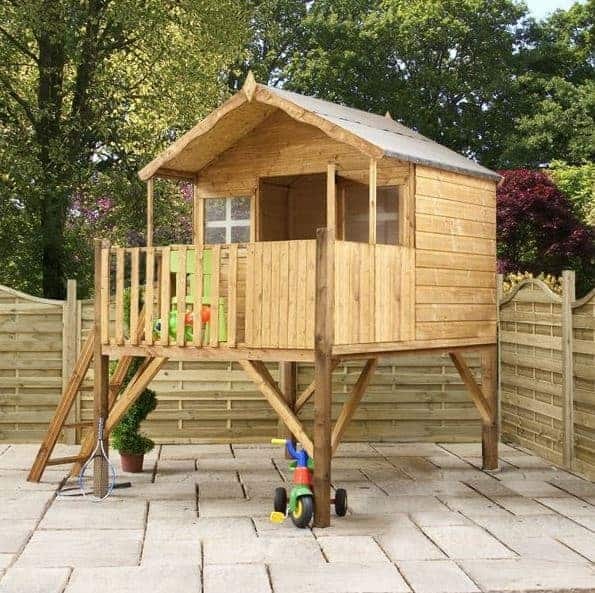 This is a tower playhouse so it is raised of the ground and the kids can get up thanks to a sturdy ladder. Once up the ladder there is a very nice little decking area that has this very cute railing to make it safe. Inside the playhouse it is quite spacious with there being, 6 feet 5 inches of width along with 5 feet 6 inches of depth. More than enough room for a dance party, board game marathon or to hide from mum and dad when it is time to clean their room. 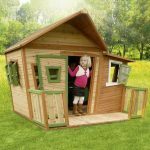 This is quite a high structure at a little over 8 feet, but inside the playhouse the headroom is 5 feet 8 inches along the ridge and 3 feet 11 inches at the eaves. This playhouse has one of the most attractive looking roofs that we have seen from Waltons. It is made with 8 mm thick solid sheet board like their other roof, but this one has a veranda that covers the decking. It really does give it quite a striking and very expensive look. Sand felt is used to cover the boards and this will work wonders at protecting what is inside from the rain. 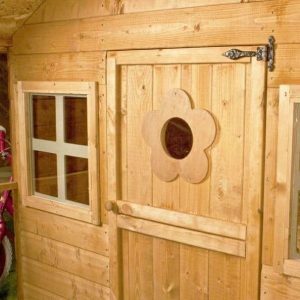 The smooth and log cabin look that the playhouse has is because of the tongue and groove shiplap cladding. Waltons have done quite an incredible job in making sure this is all nice and smooth. As well as being very attractive the cladding is a very respectable 12 mm thick which is just as thick as some high priced sheds. Inside the playhouse there is a 28 mm x 28 mm frame which will make this one very impressively strong structure. We all know that playtime can sometimes can get a little bit rough, but this playhouse is going to be able to take it because of how good the frame is. This frame and cladding combination is something we have seen a few times from Waltons and it never fails to impress us. 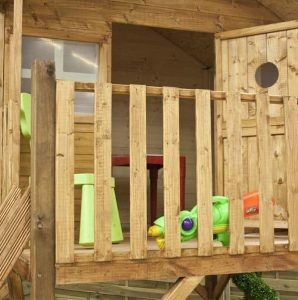 The flooring inside the playhouse is 8 mm thick solid sheet boarding which is more than up to the task of dealing with the kids jumping and messing around. The flooring used for the decking area is different and if you look closely enough you can see that it is tongue and groove boarding used here. We would have loved for Waltons to have used this in the playhouse as well, but that would have seen the price go up so we understand why they did not. 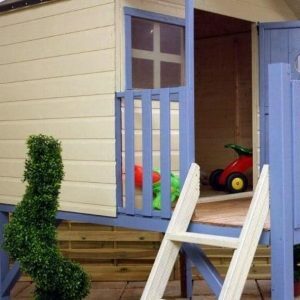 While some of the pictures show the 7′ 8″ x 6′ 6″ Honeysuckle Tower Playhouse all painted, it will be delivered to you unpainted and will require a coating of wood treatment to protect against rot. You will be given a free tub of golden brown wood treatment, with the tub being 5 litres this is more than enough to give the playhouse a very generous coating. Treatment should be applied shortly after construction and then each year to keep the wood free from rot. 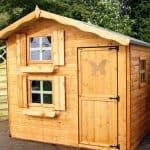 Waltons give you a very generous 10 year guarantee with this playhouse. It covers you against rot, but we must make it a point to mention that for this to be valid, you must treat all the wood. There is a very well made door right in the middle of the playhouse. It has this fantastic flower decoration that has a small styrene window in it. The door is impressively high at 3 feet 6 inches and the width is 2 feet which is more than enough room for them to bring things inside. If you have been looking for a way to declutter their bedroom then this is a great opportunity. This door has safety gaps round the edges to prevent the kids from trapping their fingers. Another safety measure that the door has is the hinges. These are strong hinges that will make sure the door does not start to sag and fall out of its place, we also love the look of these and think they go well with the overall design of the playhouse. The small window that is located on the door is joined by two other windows. There is a window on both sides of the door and they are very good sized windows so plenty of light can get into the playhouse. These are made with shatterproof styrene which is exactly what you want on a playhouse as it cannot break into lots of little pieces like glass can. We feel that overall this is one very secure and strong playhouse, but the door does not come with a lock. On a shed this would be an issue, but on a child’s playhouse in our experience a lock is often more hassle than it is worth as most of the time kids struggle to unlock it which means you are constantly having to be out there unlocking the door for them. This is actually one of the more private playhouses we have seen from Waltons. There may be two large windows right on the front, but these are shielded a little bit by the railing at the top of the ladder it is not much, but it is more than what most other playhouses offer. If the children do want to have the windows covered then a bit of fabric or even some curtains would do the job. Waltons themselves do not offer any customisation options, but as you can see from the pictures some people have painted this playhouse in some very impressive ways. We feel that even by just using the golden brown wood treatment that you get for free, the playhouse still looks fantastic. Waltons do offer an installation service, but at £199.99 it is a little high priced for our liking. If you want to give the roof a little bit more protection then you can upgrade the felt. They have 10 m superior duty felt in charcoal and olive green these are priced at, £34.99 each. 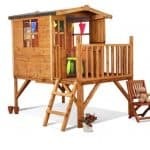 One great extra that they have is a wooden kitchen that you can put into the playhouse this costs, £49.99 and is something the kids could have a lot of fun with. 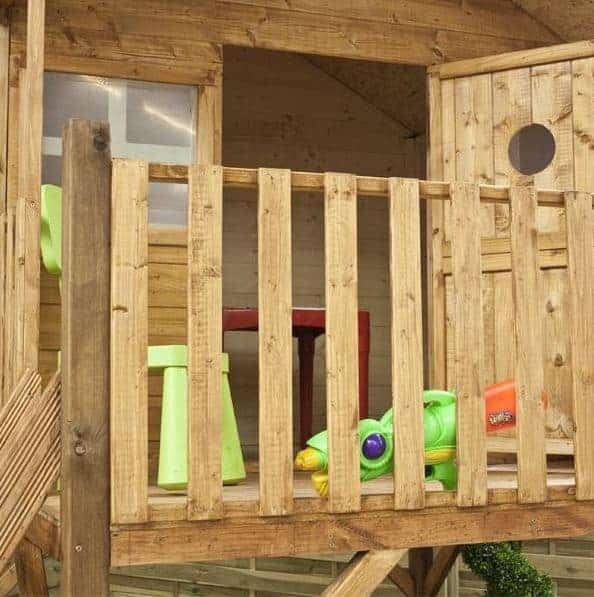 We are very pleased with what Waltons have done here and honestly apart from wishing they used the same floor for the decking inside the playhouse, there is nothing we would change. You are going to get many years out of this playhouse. We honestly believe that the kids will outgrow it before the materials show any kinds of issues. The pictures really do not do justice just how much space is in the playhouse. 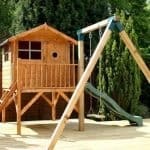 Of course as well as this there is the decking area and if the kids do not mind getting a little dirty then can play underneath as well. Having a friend to help you and keep an eye on the instructions as well as making the tea will make this a pretty straight forward process. This is a playhouse that does it all. It has a fantastic look, is strong, will last many years and it is also a very generous price. Final Thoughts: We really could not be any more impressed with what Waltons have done with their, 7' 8" x 6' 6" Honeysuckle Tower Playhouse. The overall design is just gorgeous and many people will be amazed that you only paid, £389.95 for it. 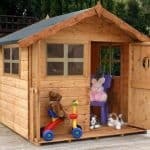 We have seen other playhouses that do not look half as good as this cost a similar price. Boys and girls will both just fall in love with this and want to spend hours and hours in and around it. A huge part of the fun for the parents we always feel is watching the kids play and organise their own little house so you will get a lot of enjoyment out of it as well. 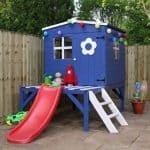 If you have the space for it then this is a playhouse that we highly recommend.